No one does fragrance quite like Marc Jacobs in terms of scents and packaging. The Marc Jacobs Fragrance bottles are all so beautiful in their own right. 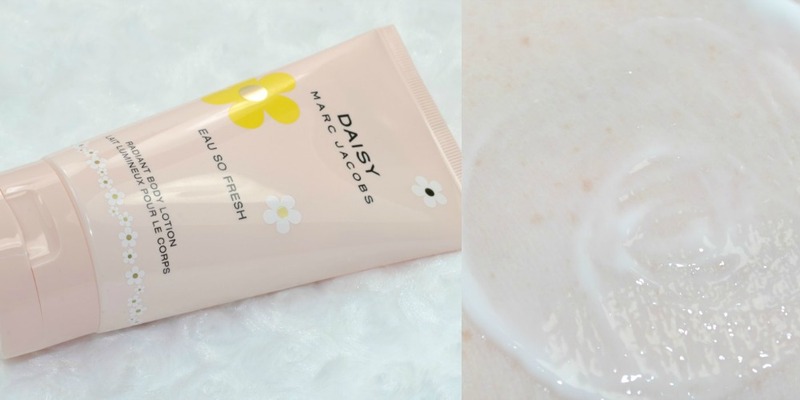 Until recently I’d only ever tried (and loved) Marc Jacobs Honey (reviewed here) but I’ve always wanted to try the iconic Daisy. The newest Marc Jacobs fragrance is Marc Jacobs Eau So Fresh Delight which is a twist on both the original Daisy and Daisy Eau So Fresh. Marc Jacobs Eau So Fresh Delight is a limited edition release for Summer 2014, whereas Eau So Fresh was released in Summer 2013. My perfume collection have recently had two new additions; Marc Jacobs Eau So Fresh Delight Eau de Toilette and Marc Jacobs Eau So Fresh Radiant Body Lotion and I was so excited to try them and see how they compare with one another. Firstly, how utterly stunning is this bottle?! Tall curved, glass bottle containing the blush pink fragrance, with a gold chrome ball lid which has soft, plastic white, peach, mint and pink daisies all over it. There is no girl in the world who wouldn’t want this bottle standing proudly upon their dressing table. This huge 75ml bottle retails for £43.95 on Fragrance Direct which I think is incredible value, for such a massive bottle.. especially a limited edition fragrance too. Marc Jacobs Daisy Eau So Fresh Delight is described as being a ‘lush and playful fruity floral’ which puts a delectable twist on the original with an enticing rush of blood orange flourished with exotic Tiaré Tahiti, and mingled with the sweetness of raspberry. The notes include; Blood Orange, Pink Pepper, White Tea, Tiaré Tahiti, Violet, Raspberry, Apricot Skin, Musk and Amber. The minute I spritzed this perfume for the very first time, I fell in love with. It’s such a beautiful fragrance… since I got my hands on it, I’ve not used any other perfume as I love it so much. It’s such a light, fruity floral (not too fruity.. and not too floral – it’s the perfect balance), sweet scent which slightly reminds me of Hugo Boss Femme. I’ve seen some comparison of this scent to Marc Jacobs Dot, but I’ve never tried Dot personally. It really does smell summery, and whenever I wear it I can’t help but feel uplifted by it. What impressed me the most, is that considering this is an Eau de Toilette, it’s amazingly long lasting… I find that I’ll apply some in the morning, and I can smell traces of it in the evening. I’ve never had an Eau de Toilette that’s lasted any longer than 3-4 hours on me. The mention of ‘fresh’ within the name also made me think that Daisy Eau So Fresh Delight might have been more of a lighter fragrance, but it’s just as potent as an Eau de Parfum would be. I can’t recommend Marc Jacobs Daisy Eau So Fresh Delight enough, it’s such a beautiful fragrance. It is definitely my favourite summer release from any perfume brand.. it’s just so summery and feminine. I’ve even popped it on my birthday list as I’m desperate to get a back up seeing as it’s limited edition and I don’t ever want to run out. I really like applying perfumed body lotions on days where I don’t want to wear perfume, or at night before going to bed as I love how they leave my pyjamas and sheets smelling lovely. I also like to layer my fragrance with the matching lotion, as it really helps to intensify the scent and make it last longer. As perfumed body lotions are a lot cheaper than buying the fragrance, I think that they’re a great way to try the scent before purchasing the matching perfume. The body lotion is packaged within a pretty blush pink tube, with a yellow, white and gold daisy design. The Eau So Fresh fragrance contains notes of; Raspberry, Grapefruit, Pear, Violet, Wild Rose, Apple Blossom, Musks, Cedarwood and Plum. Eau So Fresh smells a lot more fruity and zesty compared to the soft, sweet scent of Eau So Fresh Delight. Although they’re different scents, they still compliment eachother beautifully and I love wearing them together. The lotion is described as being a Radiant Body Lotion, so I expected it to contain some shimmer particles but it doesn’t.. it’s just a standard white lotion. It has such a velvety, lightweight consistency which melts into the skin, leaving it feeling incredibly silky and delicately scented. After trying the Marc Jacobs Eau So Fresh Body Lotion, I’d love to buy the matching fragrance as it’s also such a stunning scent.